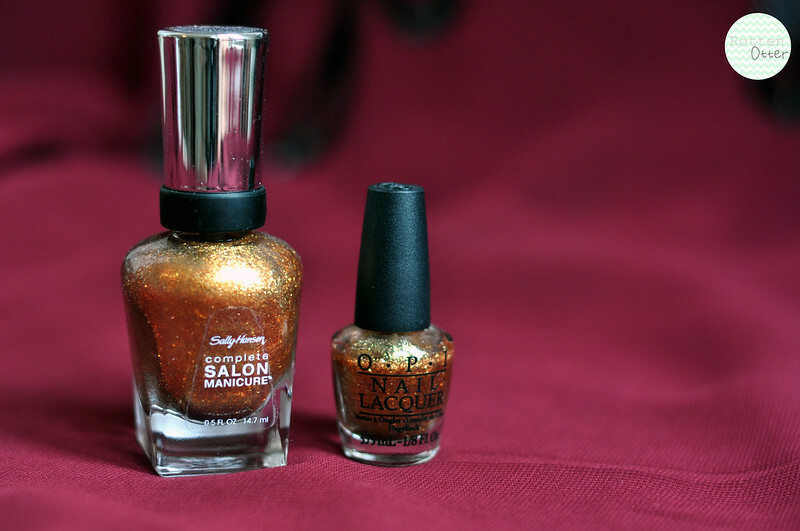 Swatches L-R: Sally Hansen Gilded Lily // OPI Goldeneye. I have another dupe to share with you today and it's even better than the last price wise. I have to say, I did order the Sally Hansen polish just to see if it was a good dupe for Goldeneye. I'm not a huge fan of this shade with my skin tone but I know how much others like it so thought I'd share it anyway. The Sally Hansen polishes are currently £1.49 on FragranceDirect.com and I have quite a few of them. My favourite being Greige Gardens. If you missed out on OPI's Goldeneye from the Skyfall collection or if you think it's too expensive then definitely buy Gilded Lily. If I hadn't written down which order I'd painted the swatches, I really wouldn't be able to tell which is which. They are literally identical and the formulas are the same as well. The first three swatches are Sally Hansen and the last three are OPI. What do you think of the dupe? Will you be buying Gilded Lily?